Lady Trojan Abbie Clarke (right) tries to orchestrate some offense against defensive pressure applied by Poquoson's Abby Barefoot. New Kent’s Lady Trojans knew they faced an uphill battle during the Oct. 19 Senior Night contest against the visiting Poquoson Lady Trojans. And despite playing hard through the contest, the effort didn’t produce any scores for the hosts. Poquoson outgunned the Lady Trojans, finding the back of the net four times in the first half and cruising to a 6-0 win that saw the contest end via the mercy rule. Lady Islander Skyler Brown positioned the guests ahead to stay. After being fouled in the penalty box, she converted a penalty stroke to give the visitors a 1-0 advantage eight minutes in. 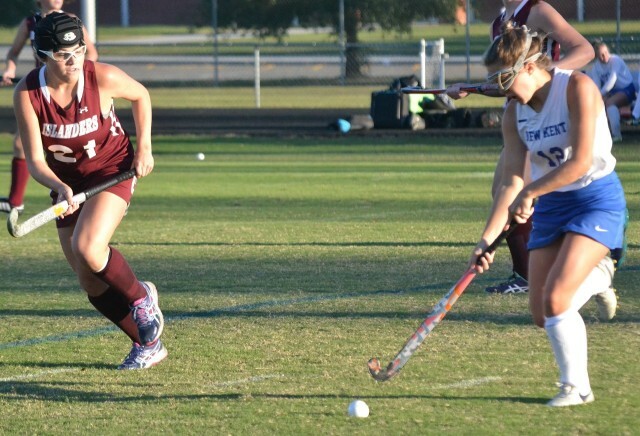 Just under three minutes later, Brown scored again to double the lead for Poquoson. Teammate Citlali Maturano got into the action shortly afterwards with a score and Elizabeth Johnson forcefully knocked the ball in the goal with five minutes remaining in the half to give the Lady Islanders a 4-0 lead at the intermission break. Meanwhile, New Kent struggled to put any pressure on the visitors’ defense. Poquoson kept the ball on the hosts’ side of the field for most of the game, making shot attempts minimal for the hosts. Meanwhile, Johnson’s second goal along with a Samantha Grimes score with 5:42 left halted the contest. Lady Trojan assistant coach Maria Bates kept her comments to a minimal on the one-sided defeat.